Officials decided to euthanize the bear after tranquilizing it. The bear that wandered into a populated area of Grand Forks on Monday is dead. The bear roamed into the city early in the day and wound up climbing a tree at University Park, which is on the east end of the University of North Dakota campus. Residents in the area were advised to avoid the area as police officers and wildlife officials worked together to try and usher the bear out of town. After tracking the bear in and out of trees in the park all day, the decision was made to tranquilize the animal and take it back to the wild where it wouldn&apos;t pose a threat to the public. Somehow, the bear wound up dead. "Yesterday evening, officials from Red River Valley Zoo assisted us in successfully tranquilizing the bear. We lowered the bear to the ground, and transported it out of town," Grand Forks police said in a statement Tuesday morning. "We assessed the condition of the bear, and consulted with area veterinary resources. We determined that, despite our very best efforts to save it, the bear could not survive the encounter. As such, we humanely euthanized the bear." It is not clear if the tranquilizers killed the bear or if it was injured during the rescue operation. According to Valley News Live, the bear was shot with 2-3 tranquilizer darts. Once unconscious, the team working to retrieve the bear brought in a utility truck and reached it in a tree with a bucket. A rope was tied to the bear&apos;s leg and it was lowered to the ground. A UND professor assisting in the bear&apos;s capture says he&apos;s not sure how many darts went into the bear. But he believes two for sure and possibly at least three before it was brought down from the tree. Video from iNewZ TV shows the bear falling out of the tree and then dangling from the rope before being brought to the ground. NWS Grand Forks apologizes for tweet slamming Mitt Romney. Someone forgot to log out of the company's Twitter account. 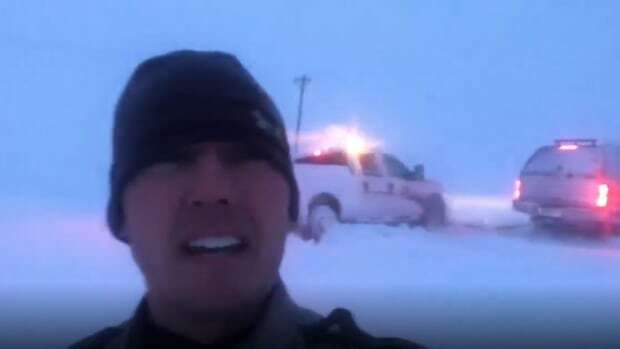 Travel is impossible in parts of the Dakotas and northwest Minnesota. The bear was near the volleyball courts at Lord Fletcher's. They were staying at a house in Point Loma Heights in San Diego.